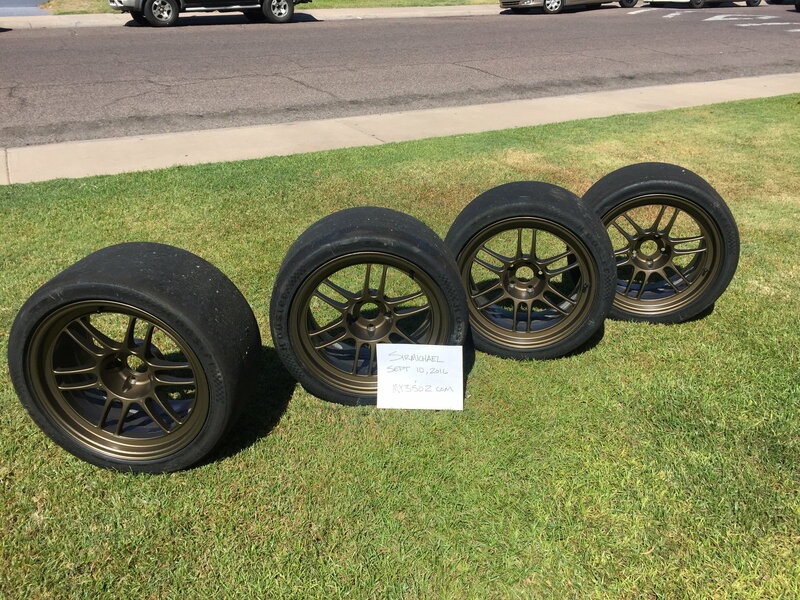 I have a set of Enkei RFP1's Bronze 18x10.5 +15 w/ Hoosier A7 295/30/18's for sale. I ran these for half a season at the local level. (6 events) I have decided to get out of the racing business for a little while and figured someone else could put these to use. The wheels are still in great shape aside from some light surface wear when the calipers rubbed against them after initial install. This can be seen in the pictures. I still ran these the rest of the season with out any issue. Currently located in AZ. Aside from race time these have been stored indoors. If you have any questions please let me know. More pictures can be found at the link below. Last edited by SirMichael; 09-12-2016 at 10:58 AM. BEAUTIFUL wheels and sticky tires should go fast! glws! I'm tired of these taking up space, price reduced. $1500 shipped and Ill even throw in the two spare scrubs I have that are in excellent condition. What's the life on the tires? Would you sale wheels alone? I'd was expecting to get at least another half season 6-8 events out of them if not the whole season before replacing them. I don't want to take the tires off and separate them. Last edited by CK_32; 11-16-2016 at 04:30 PM. Are these still available? And if they are, would they clear stock brembos? They do clear stock brembos. And these are in my garage.